The idea first came up about a year ago. Selectsoft has made a number of learning apps aimed at school-age children (Reading Fun 1st Grade,Children’s Picture Dictionary), but we really wanted something fun and educational for younger kids. Even though it took a long time to go from concept to completion, when we finally started putting all the pieces together, it came to life very quickly! April 8, 2013 for iPhone and Android. We’re working on the iPad version and hope to release it very soon. There is a matching game in the app where kids see a letter and have to pick the matching item. It’s a fun way to reinforce the connection between the letters and the words. What’s really great, though, is that it can turn into a memory game by switching over to “hidden mode”. The app teaches alphabet letters and sounds, with upper and lower case letters, as well as animal and vegetable vocabulary. Plus, the matching game helps with memory and object recognition. Toddlers and young children who are learning their ABCs and just learning to read. The match game is fun for older kids too, though, especially in memory mode. What is your favorite letter in the app? There are 4 activities in this app, but it is divided into 2 sections, teaching and checking what has been learnt. First, your child learns the letters of the alphabet in relation to either Animals or Fruits & Vegetables as flash cards, then 2 different matching games to reinforce what they have learnt. Easy Find a Match – The Letter is shown in either in Uppercase or Lowercase. You are given 8 pictures to choose from. You match the letter shown with the picture that begins with that letter and Hidden Find a Match – The Letter again is shown in either Uppercase or Lowercase. But this time the pictures are hidden. A great way to learn the ABCs along with fun animal, fruit and veggie vocabulary! Learn and play with your child and discover the alphabet with colorful illustrated cards. Tap the card to hear the word, then play a kid-friendly memory matching game. 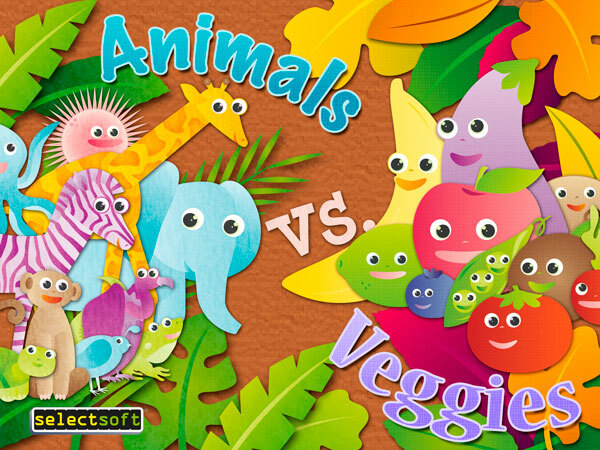 Created by educational app developer Selectsoft, Animals vs. Veggies is a wonderful way to teach children letters, alphabetical order and fun vocabulary words. 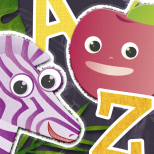 • From A is for Apple to Z is for Zebra, kids will love the bright cartoon illustrations and the friendly spoken words. 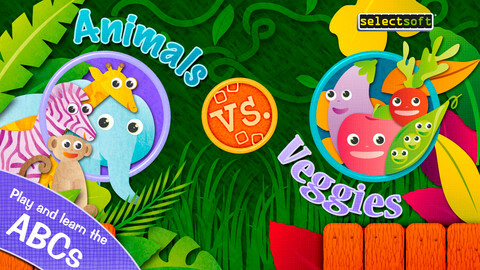 • Match the letters with animals and veggies in a fun matching game. Play in easy match mode or test your memory with hidden matches. • Enjoy 2 complete sets of alphabet flash cards with audio plus a match game. • Simple and fun to use for even the littlest learners.